In a dark room tinted with spooky red lighting and a hint of reefer, an almost naked Elvis Presley impersonator gave the audience his soul through his booming voice and lack of clothing. Machete Western, the opening band for Pond, delivered a performance that I would imagine close parallels the sound of stepping on a cockroach. While the experience wasn’t pleasant (some things just can’t be unseen), it could only go up from there. 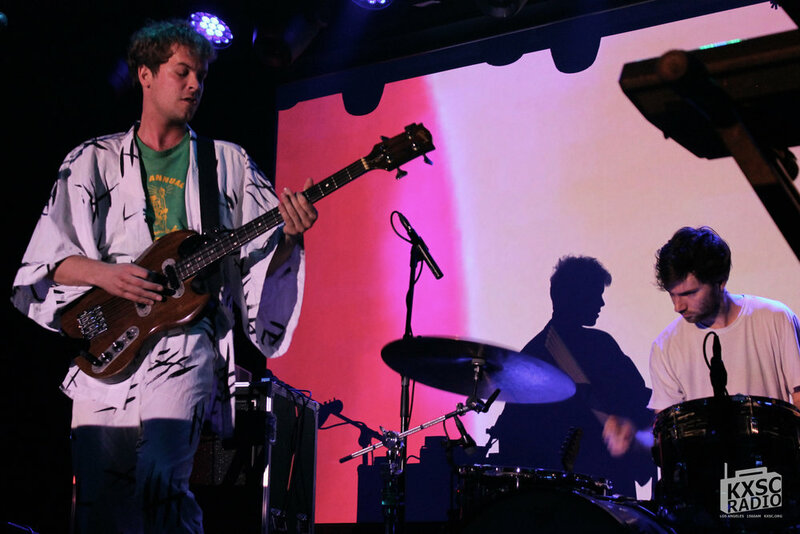 On Monday, Oct. 17, the Teragram Ballroom was packed for Pond. The audience welcomed the Australian band to the stage, and Pond welcomed the audience to the show, beginning with song “Elvis’ Flaming Star,” appropriately so. The visuals, almost that of a Windows ‘98 screensaver, added for a vintage feel and fluidity that worked well with Nicholas Allbrook’s sensual, Iggy Pop-esque voice. Drummer, James Island, only having been playing with Pond briefly impressed with solid drum playing that underlined a strong bass and mystical sounding synths. Transitioning into tracks “What Happened To The Million Head,” and “Waiting Around For Grace,” the synth-centric songs layered well with rolling visuals that were like viewing the inside of someone’s mind. Allbrook remained very animated throughout his performance, engaging the crowd with questions about the L.A. scene and connecting with the crowd with his open stage presence. Things got wild when “Giant Tortoise” off album Hobo Rocket came on, a mosh pit even breaking out. Another crowd favorites also included, “Sitting Up On Our Crane,” an “emotionally full ballad of Jay Watson” from album Man It Feels Like Space Again. Watson’s delayed voice added for a wavy, yet smooth sound effect. With song, “You Broke My Cool,” I envisioned this to be the track I'd walk down the aisle to at my wedding. Okay, not really, but the synth sounding organ felt like something you’d hear at a wedding. It was a song of sad sentiment and emotion, with lyric “you broke my cool” that painted a portrait of unrequited love. Pond’s encore was what it must've felt like to attend the prom in 1987. The funk was right, and the jams were groovy. 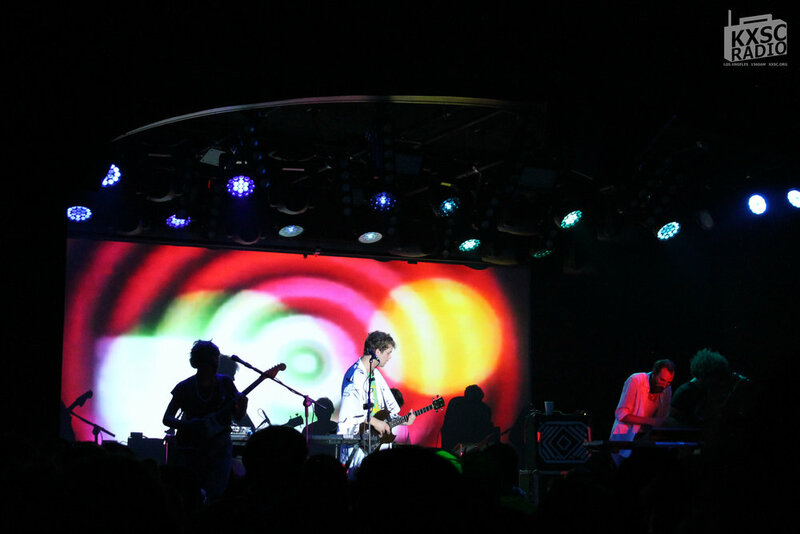 The band performed cohesively, with a lot of synth emphasis and rhythmic syncopations that took to most of the set list. Allbrook displayed his agility through hip-thrusting dance moves and Michael Jackson’s “Thriller” choreography. Throwing off his fake pearls to the audience, Allbrook exited the stage with the rest of Pond, the night concluding in the name of discotheque.